Halkbank, which is a key player in the Turkish economy and banking system, acquires one of the most luxurious hotels of the world; The Mardan Palace located in Antalya, Turkey. 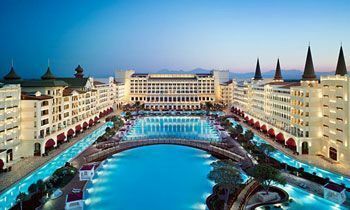 The Mardan Palace, which was built by Russian businessman Telman Ismailov in 2009, has been put up for sale by the Antalya 6th Directorate of Bailiff and Execution. The estimated price of 650 million Turkish Liras ($230 million) for the hotel and 69.75 million TL for the villas within the hotel have been determined. Halk Bank acquires the hotel in the tender by giving 50 percent of the appraised value; 325 million and 50 thousand TL for hotel building and 35 million TL for the villas. The execution started as a result of the hotel's debts to Halkbank.